The AAPA’s evening field trip on May 18 to Drouot, Paris' historic and esteemed auction house, was an eye-opener to most of the group who had never experienced a high-powered auction in full swing. Drouot opened in 1852 and is the world’s largest public auction space, with 18 auction halls where 110 affiliated auctioneers sell off objects to the highest bidders from premium art works to more humble possessions. Today, some 500,000 items a year pass through Drouot - art, furniture, wine and curios from past centuries as well as younger bargains. Our group was greeted with champagne and a presentation of Drouot from CEO Olivier Lange. Then we were taken upstairs and allowed to wander the exhibit rooms where vast worlds were on display. What sets this house apart from confreres Christies and Sotheby's is it’s accessible to everyone. You don't have to be an art expert or a millionaire to bid at Drouot. Some 5,000 people come in off rue Drouot every day to browse or bid. We were able to watch two auctions taking place, including a competitive, modern art sale where a work by French artist Yves Klein was knocked down for 465,000 euros, many times the estimate. Bidders' calls came in from around the world as a line of multilingual staff manned the phones and logged internet bids. We also had the privilege of being taken downstairs in a freight elevator into the bowels of the newly redesigned auction house to see all the items being stored for pick up. If you can’t take what you bought right away, Drouot will hold it for you for a fee. There are some real treasures down there! France’s presidential election could spring some surprises even if the lineup for the second round currently seems fairly clear-cut today, a panel of polling experts told the AAPA on April 7. Once they got into the voting booths, many voters confounded polling agencies in recent crucial votes in the U.S. and the U.K. by making choices that they hadn’t previously shared with canvassers, and there’s a possibility this last-minute effect could repeat itself in France on April 23 and May 7, they said. Over 30 AAPA members and three senior pollsters -- Frédéric Micheau of OpinionWay, Edouard Lecerf of Kantar Public and Jérome Fourquet of Ifop -- gleaned useful background information for news hounds covering the elections. Former Prime Minister Francois Fillon has lost a broad swathe of the cons ervatives’ normal backing because he has been tainted by accusations of misusing public funds and influence trafficking, as well as his harsh economic program that is turning off many center-right voters. The question is, when people get into the voting booth, will they opt for a tainted candidate or will they say, “He may not be very clean, but the interest of the country comes first,” said Jerome Fourquet. “Some might feel that it’s better to go with the devil you know” than an untested but popular candidate like Emmanuel Macron or the National Front’s Marine Le Pen, added Edouard Lecerf. 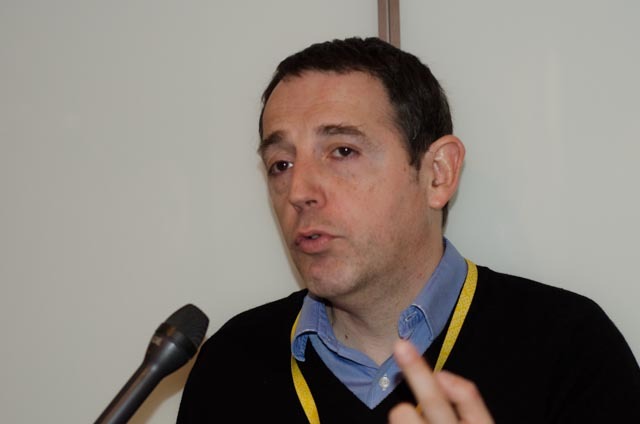 Fourquet said Fillon could benefit from an “army of reserves who will reveal themselves at the last minute,” having been too embarrassed or rattled by negative media coverage to admit their preference. If Fillon is eliminated in the first round and his electorate flock to Le Pen two weeks later, she would stand a bigger chance of winning, but only if a big chunk of left-leaning voters abstain,the pollsters said. “Accidents can happen, but absolutely everything would need to be in line for her,” Fourquet said. Frédé ric Micheau of OpinionWay noted that French voters demand honesty from their politicians before competence. Fillon is bottom of the list when they are asked to rank the candidates for their trustworthiness, he said. Resisting pressure from members, the speakers declined to predict the winner in the May 7 runoff, saying today’s poll results reflect only today’s opinions, and opinions can change dramatically on the home straight. Fourquet commented that French society is no longer divided along traditional left-right leanings but between nationalists and globalists. And 80% of Le Pen’s followers are overwhelmingly pessimistic, while Macron’s are optimistic in the same proportion. 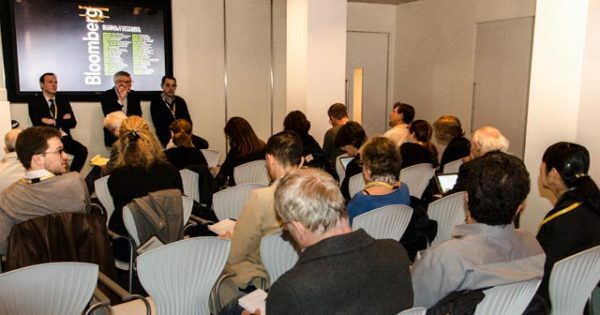 (With special thanks to Sara Llana for setting up this event and to Bloomberg News Paris bureau chief Geraldine Amiel for agreeing to host it in the Bloomberg auditorium). 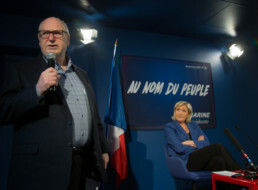 On balance, however, Webber thought it unlikely that Le Pen would become president - or, if she did, that she would win a majority in favor of leaving the EU in a referendum. 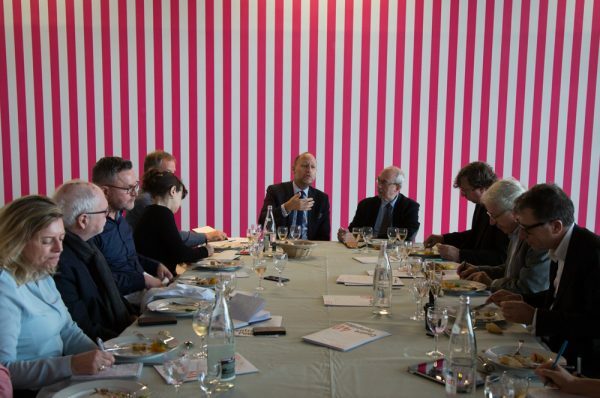 Terror attacks scared off visitors to the Louvre and the Musée d'Orsay last year, but the numbers kept on rising for the Pompidou Centre, its president Serge Lasvignes told AAPA members over lunch on Jan. 11 as the centre marks its 40th anniversary. The nine percent rise at the Pompidou - 3.33 million people turned up in 2016 - was because the bulk of its visitors are French and they see the modern art museum as their own local cultural centre to which they return again and again, Mr. Lasvignes explained. The Louvre and the Musée d'Orsay are more popular with foreign visitors - many of whom were scared by the recent spate of terror attacks - and that explains why they both reported a decline in visitor numbers last year, he said. He spoke of the raft of celebration events that are scheduled throughout the year to mark the 40th birthday of the building that scandalised many French when it opened back in 1977, when Le Figaro newspaper dubbed it a "Loch Ness monster." Mr. Lasvignes also shared his thoughts on the "dilemma" he would face if Marine Le Pen wins the presidential election this spring. 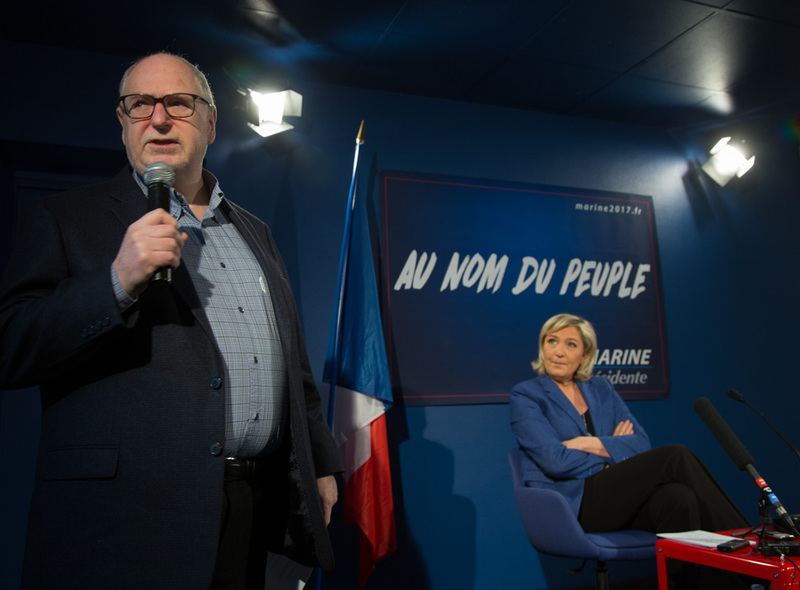 The AAPA kicked off 2017 with a news-making event on Jan. 6 when nearly 60 members met with one of France's top political personalities - National Front party leader and presidential candidate Marine Le Pen. After Brexit and Donald Trump, the world's eyes are now on Le Pen. 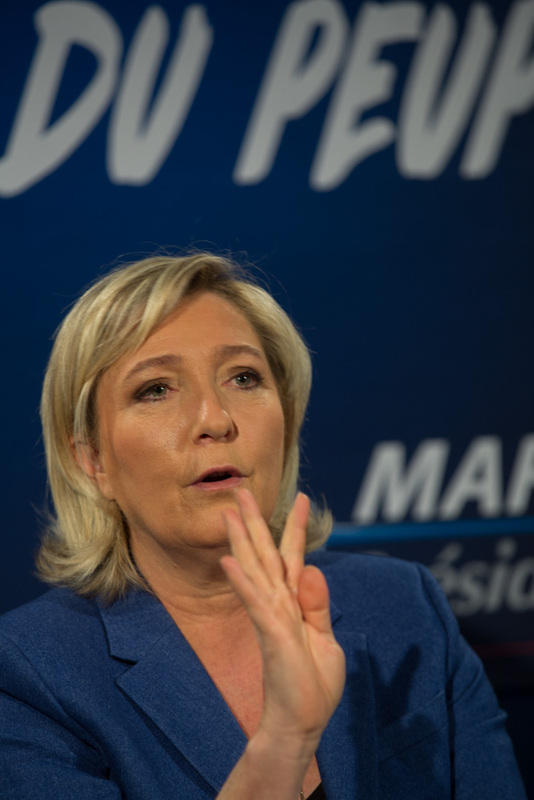 Will a populist wave also carry France's far right leader to the top? When asked if she thought Russia might tamper with the French election as it allegedly did with the U.S. vote, Le Pen chuckled, remarking that "when something goes wrong everyone loves to blame Russia." In the next breath she reminded the room that it was actually the U.S. that had listened in on the personal phone calls of its closest European allies. Le Pen has worked to "de-diabolise" her party over the last years and make it more mainstream. In that regard, her personal manner also seemed less tough. She was smooth and measured, and her stances appeared more moderate. This prompted several members to ask if she had not backtracked on some issues. Le Pen vehemently denied this, saying journalists were always looking to stir up controversy! Le Pen said Islam is compatible with French values. She said practicing Muslims, like Catholics and Jews, have every right to their religion and pose no threat to French society. It's a second type of Islam, she said, the totalitarian, sharia-espousing brand, that she'll fight without mercy. The AAPA's meeting with Le Pen held something for everyone, as the multifaceted press coverage can attest. One of the clear messages from the membership survey was that you want to meet more high-profile guests. We're starting the year with one of the main presidential hopefuls, Marine Le Pen, and we'll be working on other speakers to help you explain the election issues to your audiences. 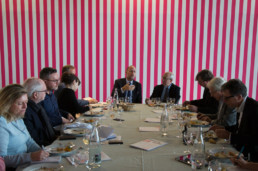 Naturally, we will continue to provide a varied menu of events outside the political sphere. 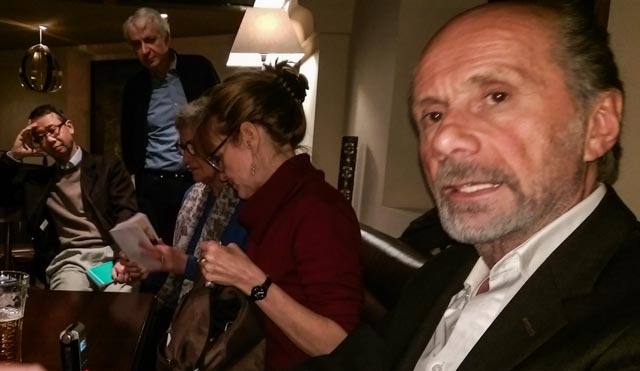 There will be more social events so you can unwind and catch up with your fellow scribblers, and hopefully another training workshop to give us a firmer grip on social media skills. I wish you and your families sound health and high spirits in what promises to be a memorable 2017. 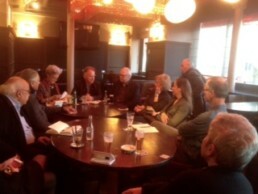 Twenty-five members attended our AGM on Friday, Dec. 16, at the Brasserie de l'Assemblée in the 7th, which started at 7 pm, lasted one hour and was followed by some socializing over drinks and hors-d’oeuvres. President David Pearson opened the meeting by looking back at 2016, which with 18 events equaled 2015’s record number. Membership increased and finances remained robust. 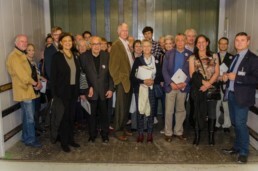 There was a broad variety of events, although our guests didn’t include any high-profile ministers or politicians. Looking to 2017, one priority is to get high-value figures ahead of the presidential election in April/May. The best attended event, with more than 80 guests, was the gala, held this year at the residence of U.S. Ambassador Jane Hartley. The Embassy gave us very attractive deal, and the overall cost of subsidizing the annual event was substantially less than at the U.K. ambassador’s residence in 2015. 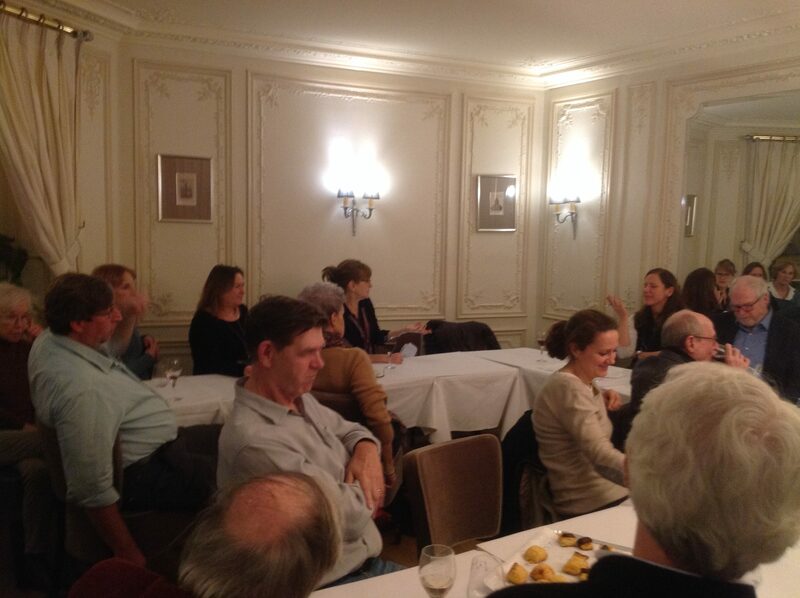 A freelance seminar in October (kudos to Barbara Casassus) in association with the NUJ’s Paris branch was success. We’re looking at ideas for other workshop/seminars to help members improve their skills in what has become a very tough employment environment. Monthly happy hours (applause for social affairs officer Linda Hervieux) have proved popular apart from the thinly attended one over U.S. Thanksgiving weekend. Suggestions for alternative venues to the Bonne Bière should go to Linda (lindahervieux@yahoo.com). AAPA’s Facebook account is thriving with 60 members signed up, 12 more than last year. The web site is looking good, with 239 visits, 951 page views in November. The Twitter account, on the other hand, has been mostly moribund due to a lack of volunteers among committee members to keep it alive, even though the U.S. ambassador is following us. •	• Barbara Casassus, who receives the "gold star" this year for her tireless efforts on the Opera, the freelance seminar, the Canard Enchainé event and one she has already lined up for next year. •	• Maria-Vincenza Aloisi for keeping the organization professional and moving forward, and for her hospitality in hosting our committee meetings. Sara Miller-Llana listed the Association’s 20 new members in 2016. We lost 18, putting current total membership at 119. David read out John Keating’s report, which underscored the Association’s healthy finances. At the date of the meeting, the current account balances stood at €1,114.75. With accounts payable of €1,375.70, there is a small deficit which will be erased with the renewal of memberships and the inflow of 2017 dues. The Association’s reserve fund (Livret A) has a balance of €18,000, unchanged from 2015. David proposed a slate that reflected a minor cabinet reshuffle due to the departure of John Keating and Scott Sayare. David ran through the proposed changes to the statutes, which hadn't been substantially modified since after World War Two, when women were first admitted to the organization. The main proposed change is to make AAPA membership more accessible to Anglophone professionals in the journalistic sphere and to bring the statutes into line with current situation. The proposed statutes were adopted unanimously. Nelson Graves presented the results of the first survey of members in 14 years. A total of 69 members (58%) responded to the survey, and the results will be circulated to members. Respondents expressed general satisfaction with the AAPA, especially the mix of types of events and the introduction of social activities, although several members called for more high-profile French politicians and business leaders, even if there were fewer total events. Several news themes and workshops for the coming year were proposed by respondents. The results of the survey will guide the committee in 2017 in terms of guests, recruitment and proposed events. There was widespread support for trying to attract more high-profile guests while offering a broad mix of corporate and cultural topics. 8. The meeting adjourned at 8 PM. 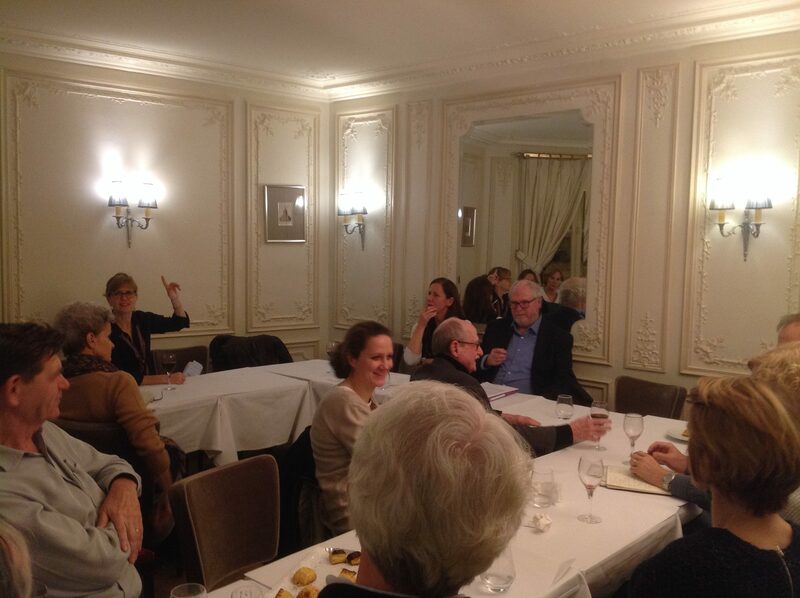 PARIS—Drawing on his large stock of entertaining anecdotes, Erik Emptaz, the editor of Le Canard Enchainé, looked back over the French satirical weekly’s 100 years of existence when he met the AAPA on Dec. 7. 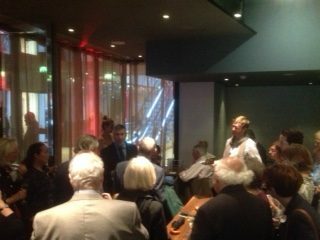 A solid turnout at the Bonne Bière heard Emptaz comment on a vast range of subjects, including the paper’s independence from advertisers and big business shareholders, the recent surprises of Brexit, the US presidential election, and François Fillon as the right/centre candidate for next year’s French presidential election. 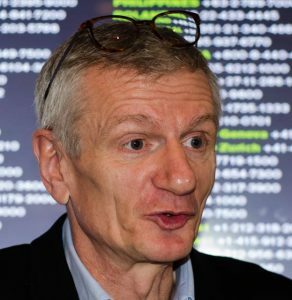 Emptaz, who joined the Canard in 1978 and became editor in 1994, said that for the moment Fillon’s chances of winning are very good in view of the disarray of the French left. The paper, which is still published only in print form, reports on serious issues without ever taking itself seriously, he says. It does not try to provoke when it conducts interviews, and its targets do not usually bear grudges because the paper attacks the facts, not the people behind them. Although leaning to the left rather than the right of the political spectrum, above all it criticises the government in power. The paper employs 30 full-time journalists plus a number of freelances, and has a weekly paid readership of about 400,000, Mr. Emptaz said. But few of the major scandals it unearths create such an international stir as President François Hollande’s 10,000-euro-month hairdresser, he told us. That story was picked by media all over the world. The paper makes provisions for lawsuits, but wins most of its libel cases on appeal. Bouygues SA sued it for 9 million euros for alleging the contractor had rigged the tender to build the new defence ministry at Balard in south-western Paris. The paper won in the end and only demanded legal costs and a symbolic euro in compensation. One of Emptaz’ many anecdotes came from his pre-Canard days at the defunct daily Le Matin de Paris, when he and two colleagues decided to confess to Catholic priests in different parts of France that they had indulged in adultery, homosexuality and masturbation. They were surprised to learn that their punishments for the same ‘sin’ varied according to the region. They were all ex-communicated from the Catholic church for breaching confessional secrecy. But it turned out that all they had to do if they wished to be readmitted to the fold was to … confess. All that and much more are contained in the book published earlier this year by Editions du Seuil, entitled Le Canard Enchainé—100 ans and now in its second print run. It cannot enforce its recommendations, but the French government’s human rights advisory body has been vocal and sometimes effective in criticizing such hot-button subjects as France’s ongoing state of emergency, the fate of migrants, and the right of Muslim women to wear head-to-toe covering burkinis on public beaches, its head says. For Christine Lazerges, a professor of penal law at Sorbonne University and president of the National Consultative Commission on Human Rights (CNCDH), the state of emergency has produced enormous economic and social costs. 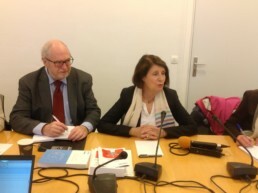 While the rights body did not object to the original decree proclaimed by President Francois Hollande after last November’s terrorist attacks in Paris, “the state of law has been bi-passed” in its many extensions, Lazerges said during a Nov. 15 meeting with AAPA members. 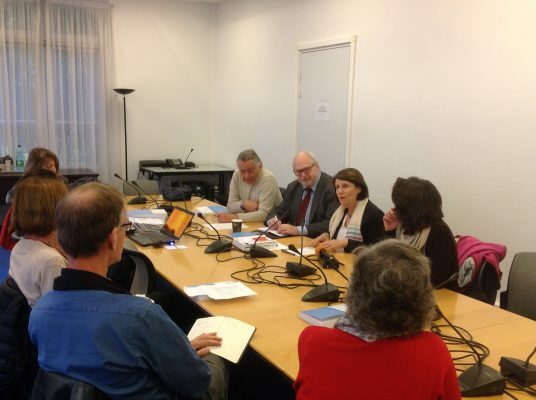 Founded in 1947, the CNCDH is made up of 64 members, ranging from unions to environmental and rights groups such as Amnesty International and Secours Catholique. Based in a government building across from the National Assembly that also houses France’s sports ministry and other state bodies, the CNCDH oversees France’s adherence to international agreements, produces reports on issues like housing, immigration, drug use and identity controls, and offers opinions on various government measures. It also has access to key government members that sometimes allows it to be quietly effective, Lazerges says. As a case in point, she describes a meeting earlier this year with interior minister Bernard Cazeneuve (now France’s prime minister) which she believes helped reverse plans to close the Grande-Synthe migrant camp near Calais. When it comes to the state of emergency -- which the government now wants to extend through next year's elections -- the CNCDH has criticized the methods and effectiveness of tactics like police searches and house arrests. On the burkini, the CNCDH has opposed efforts by some mayors to ban the Muslim swimwear on public beaches. France’s 1905 law, separating church and state, means “everyone can wear a cassock, including a priest,” Lazerges said. She also expressed concern about the broader fallout in Europe of the US presidential elections. 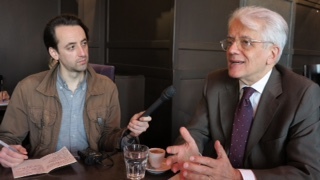 “I fear a ‘Trump effect,’” in France’s own presidential campaign, Lazerges said, suggesting Republican Donald Trump’s shock victory will feed extremist sentiments among some voters who feel abandoned by mainstream parties.